Arthur A. Levine Books, 9780590043090, 56pp. The landmark collaboration of two of children's books most beloved talents, Ludwig Bemelmans and Munro Leaf, available again! Noodle is a little dog who's very long from front to back and very short from top to bottom, which makes it hard for him to dig for bones. One day Noodle finds a wishbone, and the dog fairy arrives with a flip-flap of wings to grant him a wish: "What size and shape do you want to be?" Noodle asks all the animals at the zoo what he should wish for, only to discover he might just be perfect -- exactly the way he is. 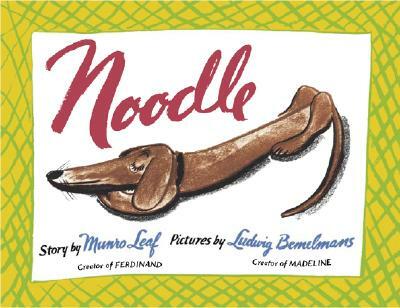 Originally published in 1937 by children's book greats Ludwig Bemelmans and Munro Leaf, NOODLE is a classic with a quiet wisdom that continues to hold true today.